Their five-generation-strong heritage is shared by many lifelong friends and neighbors who have come to work for them as part of the Olsen team. The story of Olsen Family Vineyards dates back to the early 1800s when the first homesteaders settled in the Willamette Valley and began to farm the land. Many descendents of these pioneers have maintained ownership of the fertile land. Such is the case with Roger and Jamie Olsen, whose father, grandfathers, and great grandfathers all farmed in fields now owned by Olsen Agriculture. Their five-generation-strong heritage is shared by many lifelong friends and neighbors who have come to work for them as part of the Olsen team. They all have an intimate understanding of the soils and microclimates of the near 11,000 acres Olsen now farms between Portland and Eugene. 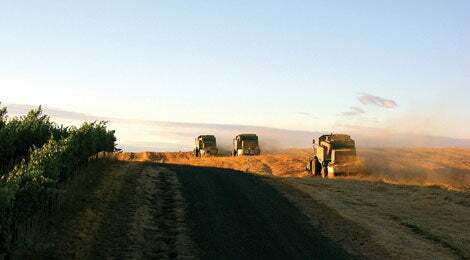 Olsen's major crop by far is grass seed (the Willamette Valley is the largest producer of grass seed in the world.) Blueberries, landscape trees and plants, peppermint, filberts, and, of course, grapes round out the list. And they're always experimenting with something new. Four hundred-fifty acres are currently planted to grapevines in five distinct vineyards. They're all overseen by Vineyard Manager Dean Underwood, a lifelong neighbor of the Olsens who came to work for them in October 2005. "I guess I sort of grew into the position," Dean says. "I've always been a farmer and I love viticulture." Currently Olsen Family Vineyards consists of five separate estate vineyards planted almost exclusively to Pinot Gris and Pinot Noir. "We're almost 50/50 Pinot Gris and Pinot Noir, plus we have about thirty acres of Chardonnay, eleven of Riesling, and lesser amounts of Gewürztraminer, Cabernet, and Viognier," Dean says. The five vineyards were carefully selected representing different elevations, soil types, and microclimates. There's Zig-Zag, where vines are planted to make efficient use of its deep fertile ground; Topology, a steep, rolling terrain bisected by a massive swale; Mulkey Hill (Fractal) where the grapes used for small lot production grow; Cottonwood, a sloping hill with deep soils; and Entropy, named by Roger Olsen for its unwillingness to perform--but that was when it was first planted. "Sometimes the land we've spent generations getting to know still surprises us," Dean smiles. Entropy vineyard is a good example. It was first planted in 2004, and the two-year-old plants came on strong. By its third leaf, the vineyard produced a full crop. Now in its fifth leaf, Entropy has proven to be highly productive, yielding exquisite, dark Pinot Noir grapes. Pinot Gris grapes are also at their coppery best on this ground. "We work in harmony with the land to make the most of it," Dean says. Olsen Family Vineyards also works in harmony with the surrounding community. Dean has helped many fellow Oregonians as they've started growing grapes. And students from the Oregon State University extension campus in Corvallis often visit the vineyards for special seminars and to conduct research projects. In fact, an elaborate Cover Crop Study is now underway under the direction of Assistant Professor Patty Skinkis of OSU. Close to four acres are dedicated to the study of clover and rye, mowing techniques, and planting times in young vineyards. "We're also applying Dr. Skinkis' practices to a couple hundred acres of test blocks out in our vineyards, to see how it works in the real world," Dean explains. "We want to support the wine industry in Oregon because the acreage is expanding wildly here and not all the newcomers have the resources and ability to learn what they need to know about farming grapes in this region." This practice of sharing experiences is found in other divisions of Olsen Agriculture as well. Farm Manager Ryan Clark, who grew up five miles away, has the umbrella job of overseeing the growing of all crops (vineyard, nursery, and grass seed). He frequently welcomes students and other members of the community asking for a little help. "We've had people come out to the farm and do research on how to grow grass seed in Korea, reduce soil erosion, and improve drainage, all kinds of things." Ryan says. Nursery Manager Tom Lodge agrees. "It's fun to have students out here. I talked to a group about grafting and why it's important," he says. "It helps them expand their horizons. Now they know that every vineyard has to have a start, and starts right here in the grafting room." "We're community oriented," Ryan adds. "And family oriented too." One recent and very important addition is Winemaker Bill Kremer, most recently the winemaker for King Estate Winery, where he made a name for himself that's readily associated with Pinot Noir and Pinot Gris. At Olsen Family Vineyards, Bill is in charge of making Viridian's flagship Pinot Noir and Pinot Gris, as well as other varietals. "Pinot Noir and Pinot Gris are actually the main wines in Oregon," Bill says. "These grapes like the long growing season here. The cool nights in September and October as the fruit ripens lock in the acidity and the color. "There's a lot of potential in the vineyards and that's exciting to me," Bill says. "And the family is dedicated to growing quality fruit and having quality wine." In many ways, Bill's agricultural background resonates with the Olsens' own story as a fifth-generation farming family. Bill was raised on his family's farm in rural South Dakota. "Although I chose not to follow my father and be the third generation on the homestead, I still have ties to the land and a tie to the cycle of the seasons that occur in agriculture," Bill says. "I feel that the less you do to the wine, the better the outcome. It means doing things right in the vineyard first." Other members of the winemaking team obviously feel the same way. In fact, Jamie Olsen chose the name Viridian for that very reason. "Not a lot of people know this, but viridian is a color, halfway between the blue skies of Oregon and the green, growing vines," Jamie explains. "The label is done in a vivid water color designed to capture where the wine came from. To give people a feeling for the intensity of the aromas and flavors inside." The 2006 Viridian Pinot Noir is a deep ruby red, medium-full-bodied wine which stands up well to spicy and flavorful foods. The 2006 Viridian Pinot Gris emphasizes the quality of the fruit from which it is made. It holds its own when paired with rich or zesty foods. "There's a lot of interest in Pinot Noir and Pinot Gris in Oregon right now," Bill says. "We're kind of a small player in overall quantity, but I think we have a corner on quality." "It's going to take a few years to get everything pulled together, but I believe we're in the right place at the right time." Bill smiles. "I believe that wine and food are important parts of life. The company is very family-oriented and we're going to have a great future together." Perhaps the verbiage on the back of the Viridian wine label summarizes it best: "Our family has farmed the Willamette Valley for five generations, so we know our land well. We've searched out the best vineyard sites and soil types and do everything we can to produce the most intense, concentrated grapes possible. Our goal is simple: grow the best grapes to make the best wine." Take Hwy99W (S. Pacific Hwy W) to Suver Rd. and head to vineyard entrance.